Maine Township High School District near Chicago has used Google Apps for Education (GAFE) since 2007 and was one of the first K-12 districts to use the productivity suite. 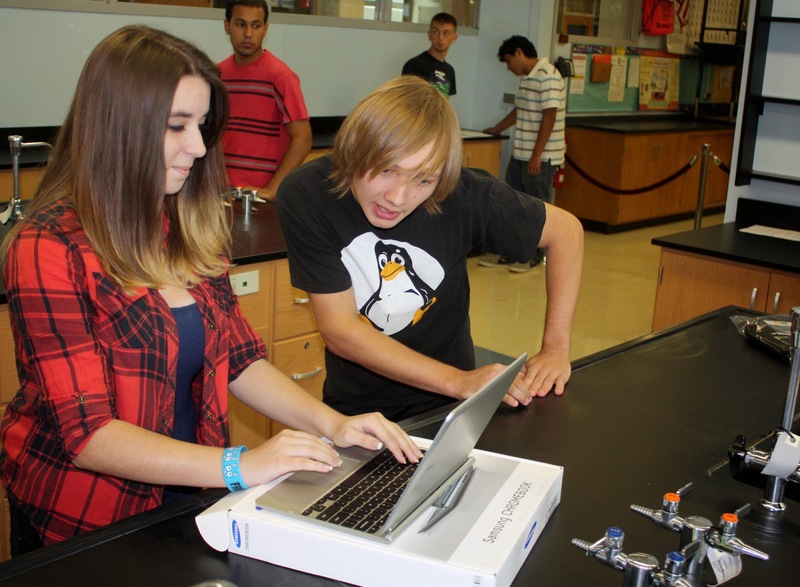 Now the three schools in the district are using Chromebooks as part of their 1:1 program. We talked with Hank Thiele, Assistant Superintendent for Technology & Learning, about how the district’s 6,800 students are using the tools and why he is confident that GAFE is the best tool for his district. For more information, read the case study. How much money have you saved by using Google Apps for Education? We’ve saved more than $784,000 over six years. Those are dollars that would been listed directly in the budget. That number doesn’t even include productivity or factor in that Google Apps for Education is a better tool than anything else out there. The key differentiation between Google and the others is how easy it is to collaborate and share in the same space. There are projects we’ve done here where people say “we just couldn’t have done this without the Google tools.” People routinely say “throw that on a site” or “put a calendar invite together.” The way the whole team works with the tools — it’s so seamless it’s scary, in a good way. How important is security to you? How does that play into your use of Google Apps for Education? Extremely important. I’m also realistic about my resources and my team’s resources compared to Google. Google has proven that they’re a secure company. They provide the same level of security that they use to protect their own data. I don’t know of any school district that has passed the same rigor of security testings that Google has. I might have a few people on my staff who are experts in Internet security and privacy, but Google has hundreds. There is no way that I can drum up the man hours within my walls to spend on security as Google has in their own walls. So, to me it’s much safer with Google in the long run, especially since the data is in the cloud and not sitting on someone’s laptop on their desk or on a USB drive. Has Google Apps for Education been helpful from the perspective of disaster recovery and regulatory compliance? We’re not concerned with disaster recovery because there is continuous backup. We’ve seen more of a benefit from regulatory compliance with legal review and discovery. The biggest thing is the knowledge that there is no losing data — you know it is going to be there. You know that if a lawyer or state’s attorney comes knocking on your door, you can open the Google Apps interface and find it. There’s no fear you will have to produce something that has been lost. The more stuff our teachers put into Google Drive the better things are for regulatory compliance and legal discovery for us. When it comes to using a service that’s purely cloud-based, what are the benefits? No matter what happens within our walls, the Google tools are available when the Web is available. A couple of years ago we lost all power for three days at the main data center that provided Internet to our schools. We called the Internet service provider and they said, “Well, we’d love to help you out, but the switches that feed your school are under four feet of water now.” While that was going on, we were working offsite and our Gmail there was fine. If we were hosting email on premise we would have been dark. The last thing you want is to be cut off from the rest of the world and being in the cloud prevented that from happening. What was the biggest concern when you first moved to Google, and how has it since been addressed? The top concern was that the price was too good to be true. People worried there would be a bait and switch. I know Google Apps for Education won’t start charging because the public pressure would be daunting if Google did that. I take comfort in that. The other thing that makes me confident in Google is their program Google Takeout. Google constantly gives me tools to move information into the the system, but it’s also easy to take it back out if I were ever to want to leave. Other companies have not been that forthright. How is the support for Google Apps for Education? Google support is as good or better than support for any product I pay for. It’s rare that I have to use support, but when I do I typically get an email response back within hours. On the rare occasions when I do need help, I can send an email or make a quick phone call and, either way, we get help immediately.